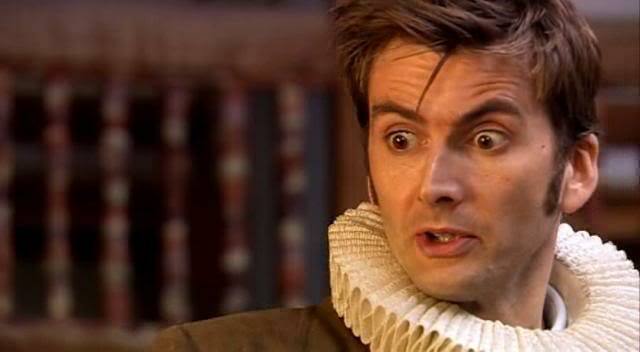 Doctor Who: Revisiting THE SHAKESPEARE CODE | Warped Factor - Words in the Key of Geek. The announcement that Russell T Davies is to adapt Shakespeare's A Midsummer Night's Dream for BBC One gives us the perfect excuse to revisit the Tenth Doctor's meeting of minds with the immortal Bard. We'd heard memories of meetings with Shakespeare on Doctor Who before - in Planet of Evil, the Fourth Doctor mentions that Shakespeare is a charming fellow, and in City of Death the be-scarfed one claimed that he helped transcribe the original manuscript of Hamlet. Two regeneration's later during The Mark of the Rani the Sixth Doctor says "I must see him [Shakespeare] again some time". 22 years later, in our Earth years that is, he finally got round to it! And it will prove a memorable meeting for new companion Martha Jones, as she in a sense becomes the "Dark Lady" of many of the Bard's sonnets! DOCTOR: I'm Sir Doctor of TARDIS and this is my companion, Miss Martha Jones. SHAKESPEARE: Interesting, that bit of paper. It's blank. DOCTOR: Oh, that's very clever. That proves it. Absolute genius. MARTHA: No, it says so right there. Sir Doctor, Martha Jones. It says so. SHAKESPEARE: And I say it's blank. DOCTOR: Psychic paper. Er, long story. Oh, I hate starting from scratch. SHAKESPEARE: Psychic? Never heard that before and words are my trade. Who are you exactly? More's the point, who is your delicious blackamoor lady? MARTHA: What did you say? SHAKESPEARE: Oops. Isn't that a word we use nowadays? An Ethiop girl? A swarth? A Queen of Afric? MARTHA: I can't believe I'm hearing this. DOCTOR: It's political correctness gone mad. Er, Martha's from a far-off land. Freedonia. Any designs he might have on her will have to wait, though. For the Carrionites have come to the merrie olde England of 1599 & he's a big part of their plan. As is the Globe Theatre, synonymous with him as the venue for performances of many of his famous works. DOCTOR: The columns there, right? Fourteen sides. I've always wondered, but I never asked. Tell me, Will. Why fourteen sides? SHAKESPEARE: It was the shape Peter Streete thought best, that's all. Said it carried the sound well. DOCTOR: Fourteen. Why does that ring a bell? Fourteen. MARTHA: There's fourteen lines in a sonnet. DOCTOR: So there is. Good point. Words and shapes following the same design. Fourteen lines, fourteen sides, fourteen facets. Oh, my head. Tetradecagon. Think, think, think! Words, letters, numbers, lines! SHAKESPEARE: This is just a theatre. DOCTOR: Oh yeah, but a theatre's magic, isn't it? You should know. Stand on this stage, say the right words with the right emphasis a the right time. Oh, you can make men weep, or cry with joy. Change them. You can change people's minds just with words in this place. But if you exaggerate that. MARTHA: It's like your police box. Small wooden box with all that power inside. DOCTOR: Oh. Oh, Martha Jones, I like you. The witches have had a hand in its construction- they hope to use it to free their brethren from the mysterious Deep Darkness. But, witches aren't real, right? MARTHA: But is it real, though? I mean, witches, black magic and all that, it's real? MARTHA: Well, how am I supposed to know? I've only just started believing in time travel. Give me a break. DOCTOR: Looks like witchcraft, but it isn't. Can't be. Are you going to stand there all night? MARTHA: Budge up a bit, then. Sorry, there's not much room. Us two here, same bed. Tongues will wag. DOCTOR: There's such a thing as psychic energy, but a human couldn't channel it like that. Not without a generator the size of Taunton and I think we'd have spotted that. No, there's something I'm missing, Martha. Something really close, staring me right in the face and I can't see it. Rose'd know. A friend of mine, Rose. Right now, she'd say exactly the right thing. Still, can't be helped. You're a novice, never mind. I'll take you back home tomorrow. Rather confusingly, later events prove the real or imagined power of said magic! DOCTOR: Creature, I name you Carrionite! MARTHA: What did you do? DOCTOR: I named her. The power of a name. That's old magic. MARTHA: But there's no such thing as magic. DOCTOR: Well, it's just a different sort of science. You lot, you chose mathematics. Given the right string of numbers, the right equation, you can split the atom. Carrionites use words instead. As did old Bill, to great effect. DOCTOR: Good props store back there. I'm not sure about this though. Reminds me of a Sycorax. SHAKESPEARE: Sycorax. Nice word. I'll have that off you as well. DOCTOR: I should be on ten percent. How's your head? DOCTOR: Here, I got you this. Neck brace. Wear that for a few days till it's better, although you might want to keep it. It suits you. And who was the Bard seen talking to? Only the same Queen who would later take quite a shine to the Tenth Doctor, that's who! You see people assume that time is a strict progression of cause to effect, but actually, from a non-linear, non-subjective viewpoint - it's more like a big ball of wibbly wobbly timey-wimey....stuff! 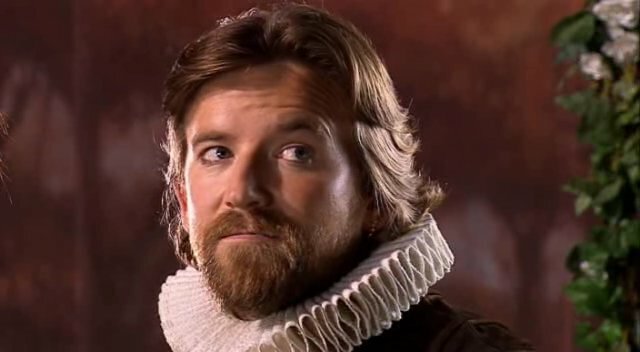 Words the Bard himself word be proud of, no doubt?